In this tutorials we will provide you that how to install and activate themes in your WordPress using Wp admin. Checkout our WordPress Themes with premium support. Follow these steps for install a WordPress Theme. 2. 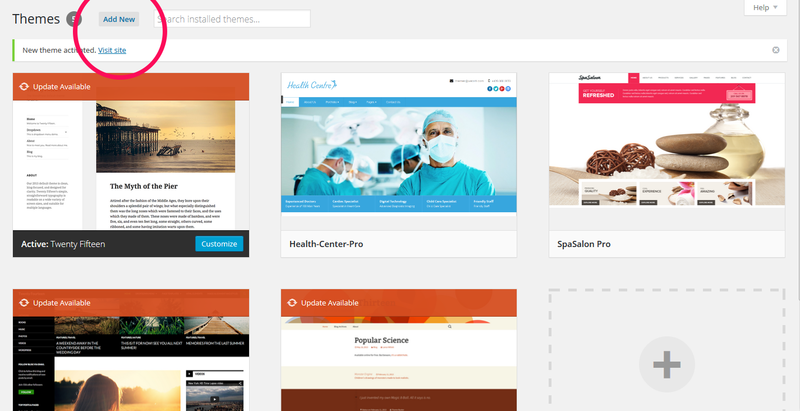 Here, you will see all the themes you have currently installed in your WordPress. If you want to add new theme, simply click on the Add New button. 3. If you have a theme, you can simply upload it from the Themes -> Upload Theme WordPress. Now click on the Upload button at the top of the page. 4. Now, click the Browse button, select the archive of your theme from your local computer and press the Install Now button. 5. In few seconds, WordPress will upload and extract the theme archive for you. All you need to do next is to press the Activate link under the message for successful theme installation.